Anders Eliasson first attracted prominence beyond his native Sweden in 1986 with his rugged Symphony No.1 which was later awarded the 1992 Nordic Council Music Prize. This is a big deal in Scandinavia; the 2016 recipient was Hans Abrahamsen’s ‘Let Me Tell You’, the recording of which became a MWI Recording of the Year. By this point he had already developed something of a mature style based on the Dorian and Lydian modes, albeit one rooted along the lines of transforming brief melodic intervals and motifs into the building of bigger structures, perhaps echoing the compositional strategies of two senior Danish contemporaries, Holmboe and Nørgård. He admitted that this path formed a conscious reaction to the modernist compositional practices rife among Stockholm composers at the end of the 60s and the beginning of the 70s. His music has perhaps not caught on to the same extent as other Scandinavian 20thand 21st century composers, but sporadic releases have emerged over the years on labels such as BIS (string chamber works); CPO (orchestral and choral pieces) , NEOS and on Swedish labels Caprice and Phono Suecia, among others. Eliasson’s voice is subtle and takes time to lodge- I have found it more than worthy of repeated hearings over the years. The present issue includes four substantial chamber works for trios and quartets including piano. Three date from his early maturity – Notturno (bass clarinet, cello, piano -1981); Senza Riposte (flute, violin, cello, piano- 1983); Fogliame (piano quartet – 1990); the final late (2010) piece is a Trio for the unusual, tangy combination of violin, vibraphone and piano. The most substantial (22 minutes), and I think impressive, of these pieces is Fogliame (‘Foliage’) for Piano Quartet. It has been recorded before, by the Swedish new music ensemble Sonanza (Caprice – CAP 21450), and was inspired by the nature poetry of Eliasson’s friend Bengt Emil Johnson (1936-2010). Indeed the tread provided by the strings at its outset evokes an autumnal woodland stroll, seemingly in a language not unlike that of Alban Berg’s quartet music but coloured by energetic and contrasting piano writing. A series of variegated episodes ensues, moving from the agitated toward a more sustained elegiac conclusion. While I don’t have a score to hand, the earlier Sonanza recording seems to revel more in accentuating the contrasts in tempo within the piece (the performance is a minute and a half shorter), but the superb instrumentalists of Norbotten Neo are recorded in a more favourable acoustic, and the sound is wonderfully immediate especially in SACD. On reflection I feel the greater breadth they afford Fogliame greatly benefits it. In its essence (if not literally) I feel this work occupies similar terrain to the ballet Maa by another Scandinavian, Kaija Saariaho (recorded on Ondine). Fogliame surely rewards perseverance. By comparison both Notturno, featuring the lithe bass-clarinet of Robert Ek, and Senza Riposte (‘Without Answer’) are more like extended miniatures, while undoubtedly inhabiting a similar sound world to Fogliame. Both are performed and recorded beautifully – their intensity again is slow-burning. With the later Trio I sense greater homogeneity of material in terms of melody, rhythm and texture, attack and release , notwithstanding the weird make-up of the combo. Allusions to the gamelan, and to jazz barely escape from an omnipresent melancholy. While the sounds are undeniably attractive, ultimately I feel the piece is a little too long, and despite the splendid playing and recording, falls short of the elusiveness it seems to be seeking. Eliasson’s music (especially that of his early career) is certainly concentrated, thoughtful and rewarding. These are fine performances and recordings of carefully sculpted chamber music that will creep up on the receptive listener in the finest Scandinavian tradition. 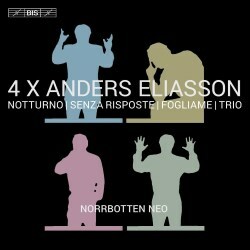 More information about this fascinating composer can be found on the website of the recently formed International Anders Eliasson Society (www.anders-eliasson-society.com).